“I really want to be the winner because I want my design to go off with the queen. I want to get on that big screen. I want to be out there. I want my name to be big. I’m excited about just being given the opportunity to design an outfit for a contestant. I’m also on edge and a little nervous, but it causes me to do a better job because I work best under pressure,” he stated. Prominently featured in the reality tv show will be Mission Catwalk Season 3 winner, Theodore Elyett, who has joined MBO as Contestants Manager. 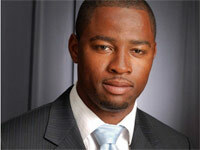 “We think that he is ideal for his role in working with the designers. 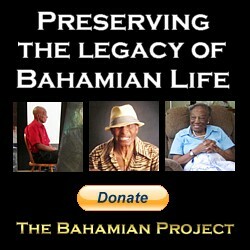 He can offer expert advice on designing in a competition and tips on how to make designs come to life,” said Mr. Sawyer. The realty tv show will air Tuesday nights on Cable 12 beginning at 8 pm and premiering June 14. 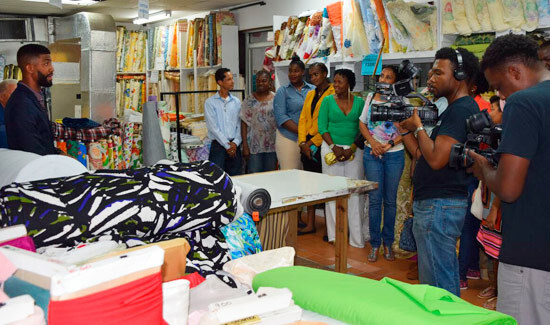 BTVI students, who are contestants in the Miss Bahamas Organization’s (MBO) Top Designer showcase, listen to Mission Catwalk Season 3 winner and MBO Contestants Manager, Theodore Elyett, just before they begin browsing Commonwealth Fabrics for notions and fabrics. This year, a reality television show is being incorporated. BTVI fashion student, Adeline Pierre, measuring a Miss Bahamas contestant for the Top Model and Top Designer contests. 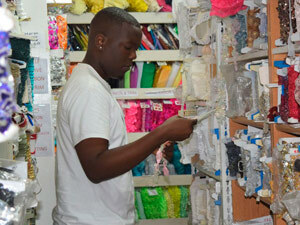 BTVI fashion student, Delano Marc, checking out the notions at Commonwealth Fabrics. Last year, the young man’s garment placed second. It was inspired by international recording artist Rihanna’s song, Towards the Sun. The fitted dress was layered with yellow fabric, accessorized with a graphic cape which had an airbrushed tree on it and covered with a cluster of leaves. 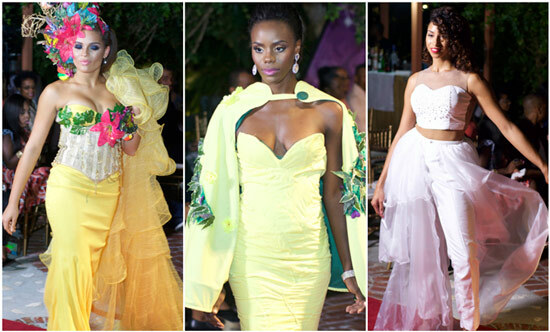 Miss Bahamas Organization’s 2015 Top Designer winning pieces by BTVI students, from left to right: Sienna Evans, sashayed down the runway in the winning outfit by BTVI 2006 graduate, Trineil Hanna. Darronique Young, strutted for the audience in a fitted gown designed by current student Delano Marc, who placed second, and Toria Penn dazzled in the three-piece ensemble created by 2010 BTVI graduate, Myrlande Julien. The creation placed third in the Top Designer showcase.